Gaming Club Online Casino has been taking bets from players since 1995 and, as such, has built quite a name for itself in the industry. The site is particularly well known for the number of winners that it rewards on a regular basis. Operating under a license granted by the Government of Gibraltar, the Gaming Club Online Casino has also adopted the Interactive Gaming Council’s Code of Conduct and ensures players have a safe and secure gambling experience at all times. The site’s players are treated to a selection of over 300 award-winning games from the prestigious Microgaming Viper Technology software suite. From classic card and table game, through to some of the latest video slots such as Hitman, the Osbournes and Tomb Raider, the Microgaming portfolio guarantees one of the largest varieties of games on the internet. There are also over a dozen progressive jackpots with millions of dollars in prizes just waiting to be won. Gaming Club Online Casino ensures that the privacy of each and every one its players is protected by using 128 bit SSL encryption technology and other stringent security controls. Payment at this site can be made using a wide variety of deposit options, ranging from debit and credit cards to Ukash, e-check and ACH, to name just a few. 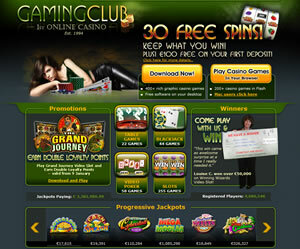 Bonuses and promotions at the Gaming Club are a definite draw card to this site. New players can enjoy a 100% match bonus by depositing up to $100 into their account, using any one of the deposit methods on the site. Add to that mystery prizes, free credits and spins and a particularly easy-to-use Bonus System money management tool, and it is not difficult to see why the Gaming Club is still going strong after so many years.